Fast forward to modern times and the “wish” can include anything from carving out more time for family and friends, rooting for a favorite college football team, or “fowl-free” travel weather. 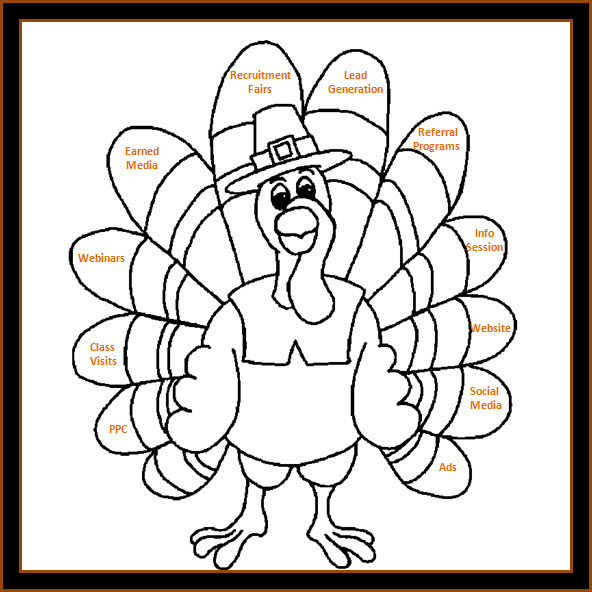 What may be more surprising is what MBA students might be wishing at the Thanksgiving table. Almost every student I’ve talked to wishes they could have researched more programs – a hard task when you are also working, trying to write essays, and manage your recommendation process. My guess (and hope) is that you will be thinking about family and friends during the holiday. If thoughts turn to work after a helping (or two) of pumpkin pie, think of how your business school can make more of these wishes come true. Pay Per Click enables prospects to feast their eyes on your MBA program as they browse the internet. What is the Call-to-Action? Is it clear and obvious? How does the messaging and design stand out from the competition? Do you provide a landing page? Make it easy for time-pressed prospects to learn more about your MBA program and collect names and contact information for a lead nurturing campaign. How can you make class visits more convenient and affordable for prospects who live far away? Can you help offset some of the travel costs? Offer discounts at a nearby hotel. Suggest carpooling or offer van service for a cluster of prospects in the same location. Think of ways to make a campus visit more enticing. Recommend great restaurants in the nearby area owned by students or alums. Have them send a personal invite to the prospect. Provide a class online for a virtual tour. What time are your webinars offered? Are they at the most convenient time for prospects? What about on-demand webinars that prospects can view at their convenience? Consider strategic partners for international student webinars such as Web2Present. Earned media, such as a mention in Poets & Quants, is a highly visible way for prospects to gobble up news and benefits of your MBA program. What are your prospective students reading? Have you considered a broad range of possibilities that reflect buyer personas? In addition to Forbes and Bloomberg BusinessWeek, what about Hispanic Executive or Entrepreneur? In addition to inviting leads in your CRM to an upcoming recruitment fair in their area, invite them to bring a colleague or friend. Like Thanksgiving dinner, there’s always room for more people at the table – even one with a branded tablecloth. Business schools are increasingly turning to lead generation partners to strengthen brand awareness. Check out Ruby Red which has provided lead generation services to business schools. You can also generate leads through digital assets such as landing pages for e-books. Create content relevant to prospective MBA students with an e-book or blog article on how to finance an MBA, for example. While your business school may already be tapping into referrals from current students and alumni, a more robust program considers a wide range of stakeholders in your business school community. Remember, customers trust peers (family and friends) above all other forms of advertising, according to this study from Nielsen. Leverage all the stakeholders who have a close connection with your university or business school to attract qualified candidates. Positive word-of-mouth advertising is a convenient and fast way for prospects to learn more about your MBA program – even if it’s hearing about it from an aunt or uncle at the Thanksgiving table! Oftentimes, we’ll plan to attend an event but something comes up at the last minute. 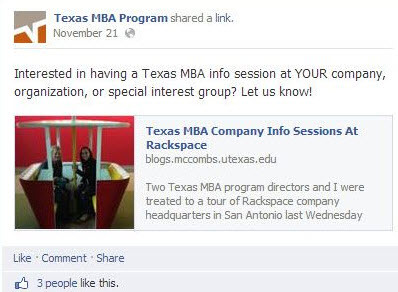 Think about the schedule of your MBA information sessions. Are you offering the most convenient time and days of the week to prospects? Increase attendance by posting upcoming information sessions on your social media accounts to leverage virtual networks. Is your business school optimizing the use of keywords so that more prospects find you? Have you performed a thorough analysis of your website to make sure it contains a strong Call-to-Action on each page? Is the messaging clear and concise to influence a busy prospect to want to learn more about your program? Is it fast to navigate like a Turkey Trot? Is the content engaging and entertaining? Or, does it make readers sleepy like a post-Thanksgiving feast? Have you included essential information like program format, delivery, and costs? If prospects have to “hunt” for information on a business school website, chances are they’ll look elsewhere. How are you increasing your numbers of social media followers? Simple enhancements like tagging photos of current students and alumni on your business school or program Facebook page is the extra gravy to “spread the word” through virtual networks. Also, include hashtags to enable your content to be found on social searches. Think of ways to increase traffic like an airport on Thanksgiving Eve, the busiest travel day of the year. How are you allocating your advertising spend to get more “meat” from your budget? Do you know someone else who can benefit from the ideas in this article? Please share it using the buttons below!